The five game final in the North American playoffs between Team SoloMid and Cloud9 was all about pride, and getting the best possible seed at 2014 Worlds. But while TSM won by the skin of their teeth, both teams’ reputations were secure. They remain the clear masters of the North American LCS division, and their real test is yet to come. But for Counter-Logic Gaming and Curse, the playoff season was one of heartbreak and disappointment. Despite the two teams’ tremendous efforts to change their fortunes this season, and surprisingly strong showings from both of them over the course of the 2014 campaign, the bitter end of the season crushed both teams’ high hopes. It also showed that, for these once-proud American teams, the road back to the top of competitive League of Legends is a lot longer than one season. In North America, the League of Legends competitive scene grew up alongside streaming and Twitch. It was partly down to simple timing, as both the game and the infrastructure for carrying streams matured at the same time. But it was also due to North America’s slightly stunted competitive landscape. Across eSports in general, North America has never had the robust tournament landscape of Europe, nor the high-level professional leagues of Korea. North American eSports have always been about personality as much as performance. NA League of Legends’ most notable teams were dominated by personalities, and the scene that grew up around them was (and still is, to some extent) fascinated by the dramas that unfolded between them. Trash talk gave rise to rivalries, and streams and vlogs helped form personal attachments between fans and players. That started to change this year. North American teams were crushed at Season 2 Worlds, but it wasn’t until most of the old organizations were rendered completely irrelevant last year that things started to change. North American LCS newcomers Cloud9 showed just how hapless NA had become. Their 25-3 record as LCS rookies showed that the division was a house of cards. With C9 knocked out by Fnatic in the quarterfinals, and TSM getting humiliated in the group stage, the writing was on the wall. It was time for the North American organizations to start making real effort to reform. Calcified rosters were tossed aside and fresh talent was imported from abroad or poached from closer to home. The North American division just had its most competitive season in ages, and for a while it looked like the region had gone from having one good team to having four or five great ones. But here at the sharp end of the 2014 season, reality has reasserted itself. North American League of Legends might be healthier than at any time in the last three years, but it takes more than a few new faces and dramatic gestures towards “getting serious” to turn around a team’s fortunes. Counter-Logic Gaming fought hard to regain competitive credibility this season, and for a while there, it seemed like it was working. They finished the spring season in third place with a record of 18-10, and led the division for most of the summer. CLG, with a new lineup featuring a European jungler and a Korean top laner, were on the road to redemption. But at the tail-end of the season, something went horribly wrong. They went winless in the closing weeks of the campaign, and the entire team abandoned the last week of the LCS season to “bootcamp” in Korea. Even at the time, there was a bit of theater to the decision. Going to Korea is time-honored way for an organization to show that it is Serious About eSports. And for American StarCraft players, traveling to Asia and playing on the Korean server really can be an important training tool. But CLG’s problems weren’t from lack of seriousness. It was growing friction within the team and a deteriorating strategic grasp of it. The first and last segments of this Machinima series, Chasing the Cup, doesn’t show a team that isn’t serious or hard-working. It’s a team with poor chemistry and worse morale. Still, there was the hope that CLG’s Korean bootcamp could arrest the team’s slide, clear their heads, and get them ready for a run at Worlds. They’d been a good team earlier this summer, and they could be a good team again. The raw talent was certainly there, and maybe Korea could serve as a kind of hothouse that would let that talent blossom. Unfortunately, that’s not how it played out. 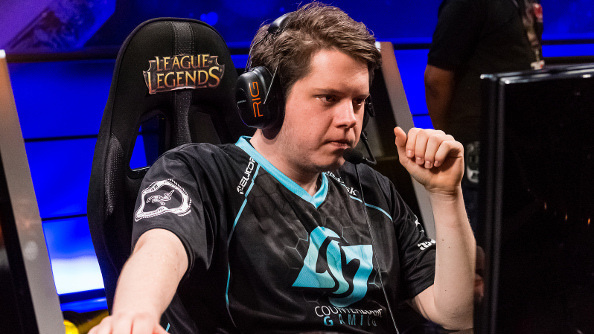 CLG were swept out of the first round by Curse, and then lost their fifth-place match against Dignitas this weekend. The disappointment was matched only by the humiliation of CLG finding itself sent down for possible relegation. CLG would be in much worse shape, in fact, if not for the fact that next year’s LCS now has room for two more teams. The scary thing about CLG’s defeat was, from the outside, CLG looked like a team that had done an awful lot of things right. They’d gained good personnel and put results ahead of personalities. But their complete disintegration at the end of the season showed how brittle a thing a team can be. When thing were going their way, CLG were a force to be reckoned with. But the moment the team had to start reevaluating and overcoming some problems, it fell completely apart. Now the challenge facing CLG’s management is figuring out what parts of the team are worth salvaging, and what needs to be cast aside. I won’t let this happen ever again. I knew all the answers but never acted on them. Change will come, I promise. Things went better for Curse, who made it into the third place match and had a great chance at making Worlds. In fact, they looked like a lock on Sunday after going up 2-0 against LMQ, the Chinese team who came over the US to compete in the LCS earlier this year. The contrasts between the two teams were interesting. With the possible exception of Team SoloMid, no team has been as personality-driven as Curse. It’s a team that’s always played with a bit of a chip on its shoulder, especially since many of Curse’s best players have arrived at the team after being let go by more established squads. LMQ, on the other hand, came to North America to escape a troubled Chinese League of Legends scene. While some of those problems followed them, they still had a huge impact on the North American scene. For a time, LMQ looked like they were bound to knock Cloud9 off their pedestal and top the division. While Cloud9 and Team SoloMid ultimately proved to be stronger teams this season, LMQ vastly exceeded expectations. 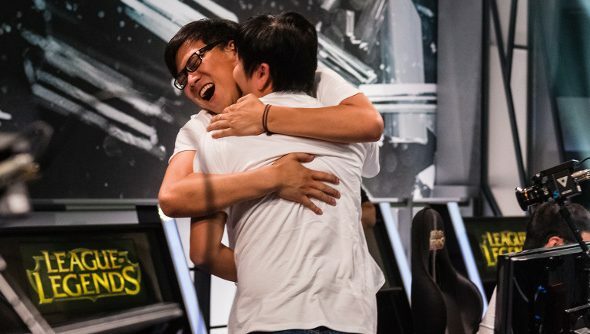 Their clash turned into a nightmare for Curse, as Curse squandered their commanding 2-0 lead and let LMQ tie the series. Then, with a trip to Worlds on the line and the pressure on, Curse seemed to lose their composure as they challenged LMQ in one fight after another, despite the matchups and positioning favoring LMQ. And as they started to fall behind, they started coming back at LMQ in increasingly bad situations. 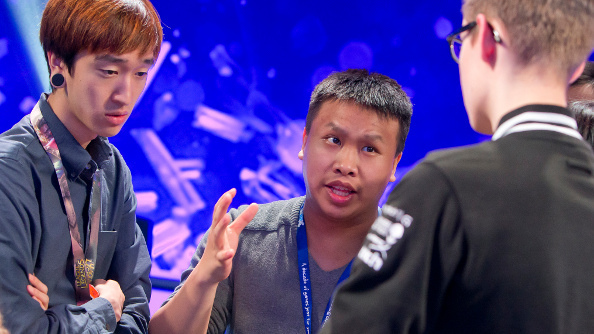 With help from a Curse meltdown, LMQ clawed their way into worlds. This playoff weekend at PAX showed that the problem facing North America’s second-tier teams is no longer talent or “seriousness”. Curse and CLG both made a lot of good changes this year, but they did not quite have the whole package. CLG never quite gelled as a team, and didn’t have the leadership or management to force that roster to work together. Curse, on the other hand, played well as a team but did not handle picks and bans well. They let LMQ get hold of the tools they wanted, and then Curse played exactly the kind of games they needed to avoid. The 2014 season in North America was the season the North American scene admitted it had a problem and started fixing it. But the next part is harder. It’s not about getting better players or putting performance ahead of personalities. It’s about building organizations and training regimes that let players be their best. It’s fitting, then, that TSM emerged on top of the division on Monday night in Seattle. No team typified North American League of Legends — warts and all — more than Team SoloMid. No team was more beset by internal strife and external scrutiny, and no team owed so much of its relevance to Internet celebrity. The story of TSM’s journey from Worlds 2013 (where they ended their run by throwing their with some fan service picks) to the top of North America in 2014 is the story of TSM maturation into a professional eSports team. Not a brand, not a game-themed reality show. A team. Their victory of endurance, tactics, and pick strategy was a triumph of professionalism. While the team still has trouble dodging drama (Alex “Xpecial” Chu’s departure was both mystifying and messy), the rebuilding they did in the wake of the 2013 campaign transformed the team. Now, as they turn toward Worlds alongside LMQ and Cloud9, they have to show that North America deserves its seat at the global table. But no matter how it turns out, North American League of Legends finally seems to be back on track. All photos credited to Riot Esports.